Home Does ‘Brexit’ mean I should move or improve? Does ‘Brexit’ mean I should move or improve? Gary Warby, Director Premier Windows, explains why ‘Brexit’ makes it the right time to invest in home improvements. According to a recent poll by Plentific following the Brexit vote, one in 10 homeowners are now more likely to consider home improvements instead of selling, with 12 per cent of homeowners less likely to move in the next three years. When it comes to the housing market it makes a lot of sense to adopt a ‘wait and see approach’. In reality laws of supply and demand make a crash very unlikely – we simply don’t have enough affordable homes. But biding your time and taking advantage of the record low Bank of England base rate, makes a lot of sense right now. Money is cheap and as long as you can afford repayments, putting money into home improvements which will increase the value of your property rather than the legal fees that go with moving could help you cash-in in the long run. New windows and doors will make your home stand out to potential buyers when you do come to sell but will also make it more energy efficient in the long run. What if you have a growing family and need more space? Well again you have options without moving. Anything at the top or the bottom of your property is going to cost a typical loft extension costs between £30,000 and £60,000, adding space by digging into a basement if you have one is even more – £300 to £400 per square foot of accommodation. And the space you get isn’t always as functional as you may have hoped for. Lofts weren’t built to live in. They can be noisy as they have little noise insulation, another thing to consider is heat rises, so even if you have got great insulation, the heat collected by your property during the day has a nasty habit of collecting on the top floor. Ground level additions to your home tend to work best from a practical perspective. Filling in a side return can give you new space for a kitchen without encroaching too far into your garden. But be creative – you don’t just have to have a traditional extension. A new generation of highly insulated and high specification conservatories, sun rooms and orangeries are giving homeowners far more flexibility and year-round living space. Energy efficient and even self-cleaning glass means that new glass extensions can be used for a host of different uses, for example for use as dining room, sitting room, home office or even gym. We can also install free-standing garden and sun rooms away from the main property to create an enviable commute to the office! There are also a number of alternative options including the addition of an atrium or ‘lantern’ roof to a ‘traditional’ brick extension, plus ancillary products, for example bi-folding doors, that when retracted can open whole facades to the great outdoors. A recent study based on calculations by Nationwide Building Society found that a home extension could increase a properties worth by 22 per cent or £42,700. 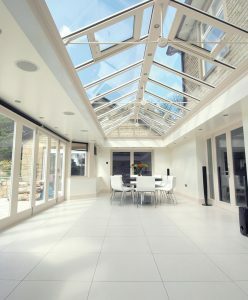 Moreover, the Royal Institute of Chartered Surveyors suggests that the addition of a conservatory or orangery will increase the value of your property by around five per cent, delivering the great return on investment of almost any home improvement. Brexit raises a number of uncertainties, so an element of caution is sensible but with low costs of borrowing and lots of options to increase the value of your home, bricks and mortar remain a safe place to put your money. Call enquiries@premwindowsanddoors.co.uk or call 0800 854 353 to find out more.